In the early l990’s, a very exciting group had formed, The Children’s Literature Council of Pennsylvania. In l992, I wrote to Seven Herb, then president of the association, asking if the Council might sponsor The Lee Bennett Hopkins Poetry Award to further promote the genre in a different way since the NCTE Award was being given to a poet for their aggregate body of work every three years. The award I would establish would be for a book of poetry, given annuallly and come with a cash prize that I would fund. Currently $l,000.00. I wanted the award to be part of Pennsylvania history since I was born in Scranton. The award seal is a replica of Jessie Wilcox Smith’s MOTHER GOOSE, depicting Mother Goose embracing two children. Smith was also born in Pennsylvania (Philadelphia). The first award, presented to Ashley Bryan for SING TO THE SUN (HarperCollins), was held at the Governor’s Mansion in Harrisburg – a grand ceremony attended by hosts of publishing people and family members. This was Ashley’s first book of poetry. A few weeks following the event a large package reached my home. It was the original jacket art from Ashley’s book WALK TOGETHER CHILDREN: BLACK AMERICAN SPIRITUALS. It is a piece of art I treasure. 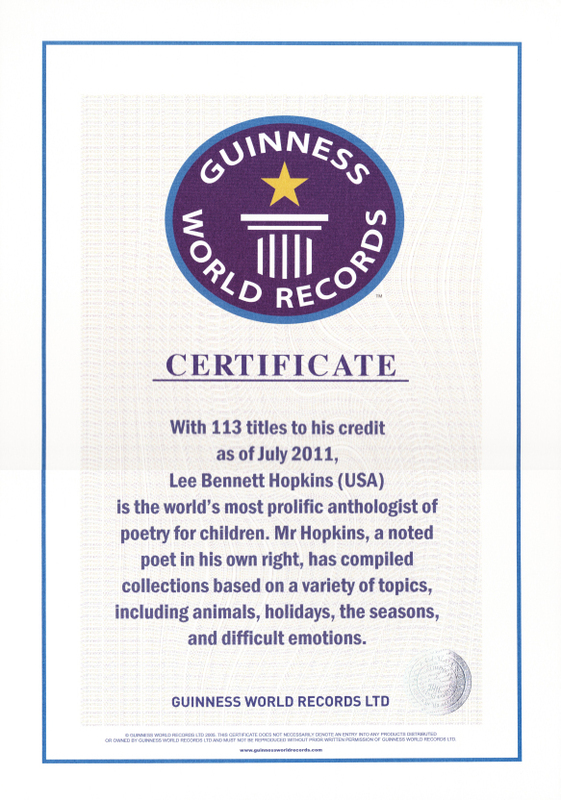 The award, now named The Lee Bennett Hopkins/Penn State University Poetry Award, administered through Penn State, remains the only one of its kind in the United States. Complete information can be found on my site at AWARDS. 2017 marks the 25th Anniversary of the Award. It is so hard to believe so long a time has passed. My beloved maternal grandmother, Lena Thomas, always told us to ‘give something back.’ In memory her wide words I am ‘giving bak’ something to a gene that I cherish as well to honor the place where I was born. Copyright © Lee Bennett Hopkins. All Rights Reserved. Powered by Just Know Computers.